This year, FOHC awarded its first annual Environmental Stewardship Award to Scott Bridge Company of Opelika, Alabama for their eco-conscious building practices. This award exists to celebrate those businesses and individuals who demonstrate outstanding and exemplary environmental practices with positive long-term impact. Steve Gilbert accepted this award on behalf of Scott Bridge Company at the 2011 FOHC Annual Banquet. 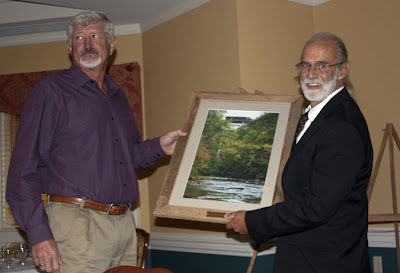 The award was given according to John L. Wathen, Hurricane Creekkeeper, for exemplary "Best Management Practices" while working to rebuild a tornado-damaged bridge over the creek. 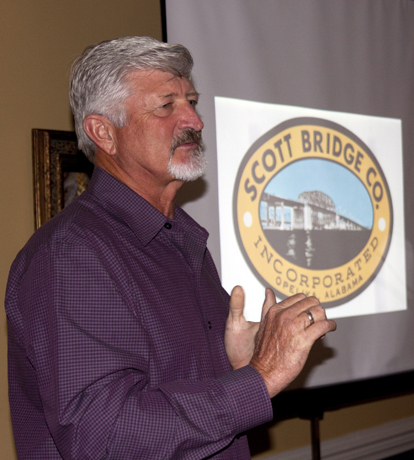 “While rebuilding the railroad trestle over Hurricane Creek, Scott Bridge Company has done an exemplary job of controlling erosion and runoff on their job site. They have gone far beyond the minimum required by the law. In fact, there have been times when the water coming off of the site behind their turbidity curtains has been clearer than the water coming from upstream. Scott Bridge Co. showed up here and right away started not only replacing the bridge but helping storm victims and neighbors. They have shown nothing but the utmost respect for this waterway and our community." If you would like to nominate a local business, organization, or individual for the 2012 FOHC Environmental Stewardship Award, just fill out the form below and an FOHC representative will get back to you for more information.